Building upon a national reputation for producing first class, progressive and provocative professional theatre, San Diego REP is now setting the stage for the next ten years of creativity. SETTING THE STAGE is a four year $7 million fundraising campaign, with a $3 million endowment, which will secure the financial future of the company, dramatically enhance audience engagement and community partnerships, assure leadership continuity and take the artistic programs to a higher ground. SETTING THE STAGE will secure the financial future of the company for the next ten years. The $7 million goal provides a $4 million investment in institutional stability and artistic initiatives and a $3 million endowment of the artistic director position. A seasoned philanthropic and marketing staff, a dedicated team of community volunteers and increased marketing and capacity building strategies will increase attendance by 33% and donations by 40% by 2019. SETTING THE STAGE dramatically expands our ongoing groundbreaking audience engagement events and community partnerships, as The REP welcomes daily to our home curious souls from all parts of our binational region and beyond. SETTING THE STAGE supports an ongoing enhancement and deepening of the company’s artistic programs that begins now, in Season 41. Audiences will experience an increased commitment to the commissioning and production of world premiere plays, including some, such as Manifest Destinitis, that cast an eye on stories about our binational region. Exceptional artists in residence will be at the center of REP programming each year. A new Educational Initiative will regularly put students from across the county on the Lyceum stages. Most significantly, the company will substantially increase resources devoted to the Artistic Virtuosity Fund – an extraordinary effort to continuously fund acts of virtuosity on REP stages many times each season. San Diego REP begins its fifth decade with a deep commitment to programming that makes San Diego a more inclusive, progressive and enlightened place we call home. Our work continues to be guided by values we hold dear: Citizenship, Diversity, Collaborative Partnerships, Emotional Engagement, Open-Mindedness, Virtuosity - and above all Curiosity. We wholeheartedly invite you to join this journey and help Set the Stage that continues to assure San Diego REP’s reputation as a vitally necessary part of our city for the next ten years. 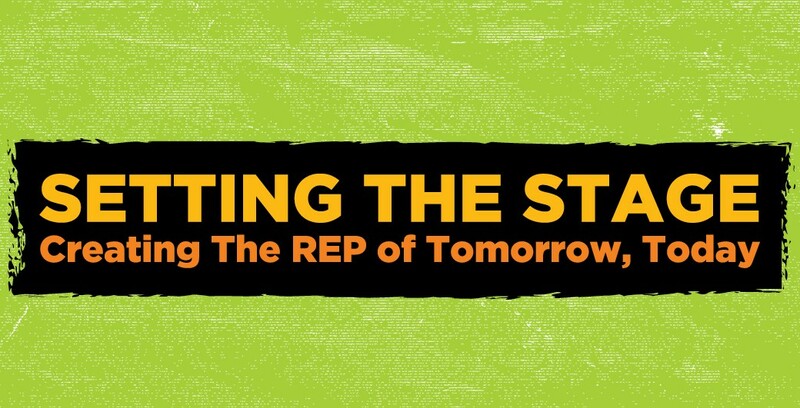 For more information on Setting the Stage, please contact Director of Development, Beth Savage, at 619.231.3586 or bsavage@sdrep.org.